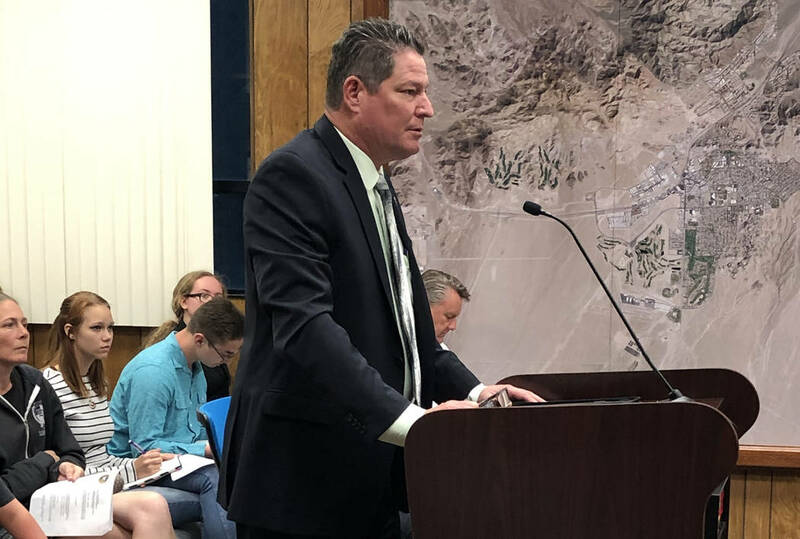 Boulder City Utilities Director Dennis Porter presents the resolution for a utility advisory committee at Tuesday's meeting. Council approved it unanimously. Council unanimously approved creating the seven-member committee to advise them, the utilities director and city manager on matters concerning the operation of the city’s utilities: water, wastewater, electric and waste management. Before approving the resolution to form the committee, council had to decide whether it should have five or seven members. Both Councilman Rich Shuman and Councilwoman Peggy Leavitt said they thought it would be better with five members because it might be hard to fill with seven. Councilman Kiernan McManus advocated for seven people because he said it would encompass a “wide range” of utilities and there was enough interest from the community. “There are a number of people who have expressed interest in it,” he said. Councilman Warren Harhay, who initiated the idea of the utility advisory committee, agreed with McManus. “The utilities touch everybody. … They (the community) have an interest in the utilities that they would not have in other committees,” he said. Mayor Rod Woodbury agreed and said he thought there would be a lot of interest at first. Under the resolution, the utility advisory committee will hold regular meetings at least every three months. They will be open to the public and comply with Nevada’s open meeting law. Special meetings can be called by the committee’s chairman or three of the committee members. In addition, the city manager and a majority of the City Council can request one be held. Utilities Director Dennis Porter will be on the committee, but his role is to serve as staff support. He will not be a voting member. To serve on the committee, it is recommended but not required for the volunteer applicants to have related experience in utilities, utility resource planning, business management, financial planning and engineering. To access the volunteer data sheet for consideration, visit http://www.bcnv.org/185/volunteer. ■ Canvassed the returns for the April 2 municipal primary election, approved staff to send the results to the secretary of state. There were no errors in recording the votes from the election. ■ Approved an agreement between the city and Boulder City Professional Firefighters Association for the employees who are part of the firefighter/fire engineer bargaining unit. The contract is for five years and has a fiscal impact of $247,000.